As a lifestyle blogger, photographer, and business owner I often find myself out and about chatting with new acquaintances. Chances are there’s a point in the conversation where we want to collaborate or stay in contact. I reach in my bag for a handy business card and usually find myself fresh out! Staying on top of everything that goes into managing a business can be costly and time consuming. If you’re just starting a business, or looking to create a personal brand, there’s a chance you’re on a budget. Creating various branding and marketing supplies to grow whatever it is you’re working towards can quickly get pricy when working with designers to create a custom look. Thankfully there are many affordable deign templates that require just a bit of know-how to help save some serious cash. In this tutorial I’ll walk you step-by-step through designing a modern business card on a budge using templates. 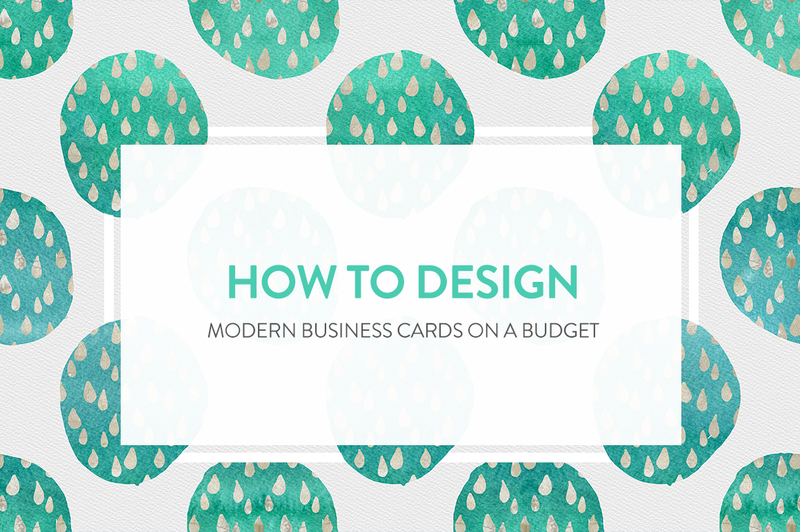 With access to Photoshop and these design pointers, you’ll quickly be customizing your own business card without breaking the bank! For this project you’ll need to download your favorite business card template. I chose this template because I love the geometric lines, clean look and capability to add my own photos. Also you’ll need to gather two of your favorite fonts. You can go with the fonts suggested on the template or customize by choosing your own. The first thing you need to do is download the file onto your computer. The Moss Geometric card template came with helpful instructions in a text file to walk through each step of the process. That is an excellent place to start when customizing your new business card. Once downloaded open the files with Photoshop. Chances are you’ll be notified that the fonts in the template cannot be found on your device. You will either need to download those, or use two of your choice. Stellar and Azedo are great fonts available for free through TheHungryJPEG and keep with the geometric theme of the card template. I was excited to include these on my variation of the cards. Once you have got your fonts picked out you can start customizing the template to meet your needs. Click on the font layers and update with the information you would like included and change to the fonts and size of your choice. Next you’ll need to pick out the photo or photos you would like to include. There are several options available here [https://thehungryjpeg.com/photos/] or you can include your own. For my cards I have chosen a couple of different images I took to print a variety of cards, but this is up to you. Once you have chosen your image(s) open them in separate tabs. Click and drag down on each tab so that it pops into a completely new window. You will then be able to view the template and image next to each other. You’ll likely need to resize your image so it is not too big. I resized mine down to 1000 pixels on the long side to ensure it would fit in the space included on the template. Once you have done this preparation you are ready to drag the image into your template. Make sure you are on the template screen and double click on the “photo” layer thumbnail so it is selected. Now click and drag your photo until you see it appear in the frame. Move the photo until it is in the position you prefer. Save your work at this point if you haven’t already. From there you can customize the colors of your card accordingly. I am opting to keep mine simple on the front of the card because it matches my other marketing materials. Next click over to the mossbcback.psd file. You can further customize the look of this side by adjusting the color of the geometric shape to match your branding. Simply select the “pattern” layer and double click on “color overlay.” From there you can adjust to meet your needs. In just a couple of minutes, you have created a beautiful and unique business card on a budget to help spread the word of your brand and share contact information. Give this project a try and share with us on social media @thehungryjpeg! We love to see your creations!